When you are away in the war zone , people keep asking me how it is to be a soldiers wife and that's a difficult question to answer. Unless you are one of them no one can understand the inner feeling of being such a wife.When I close my eyes I imagine a nightmare so terrifying that I cannot breathe , my whole body squeezed with pain and I barely can't get up. You are my husband and my best friend and every single minute you are fighting the enemy and there's nothing I can do and it always wet my eyes.Every time the telephone rings it gives me a startled . I fear that my worst fear will come true through those lines. I keep my radio on all the time and every time I hear a bomb or killings I fear where you are and what you are doing and how safe you are. There are times that I don't hear from you for days and I have no way of communicating .Those are sleepless nights for me as I think of you day and night. Some times I even don't know where you are or who to contact with. All I can do is silently pray for your life. It is not easy to wake up every morning with a heavy heart knowing that there's no end to this and every night I go to bed i think of your nights in the battle field. I know you never have a peaceful sleep and fear crept all around you, with sounds of firing arms and bomb explosions and fear of enemy attacks are part of your nights and every time I close my eyes i think of you. I always live in fear of your life and there's no way I can calm my self. All I ask and pray is for the safe return of you my love.I have lost all my life's controls to this war and some times I feel I don't know this world anymore. I feel trapped in my own world or am I trapped in a hostile world of terrorism ? The laughter , the joy which once embraces this house is no more and grief and darkened tears have wrapped our life's. I feel I'm captive with fear and loneliness, I feel I'm a victim of war but this is what I am , this is who I am .....I'm a solider's wife. Excellent. You are right, only a woman who were in those shoes knows the real pain she carries in her heart. I experienced that for a short term not as a wife but as a lover to a Air Force pilot and every minute was living hell. You never know when you going to hear that he is no more. 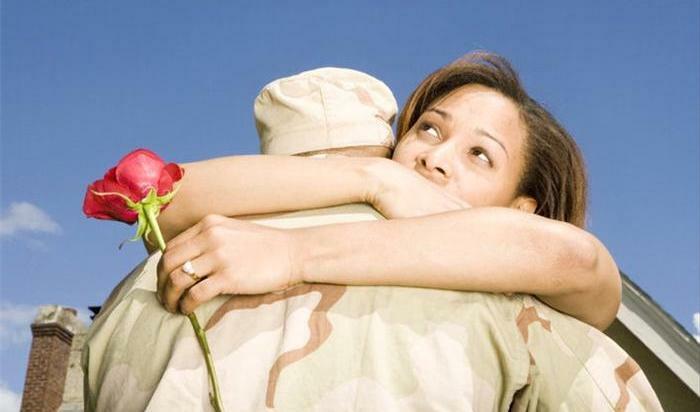 But soldiers love so intensely that they make up when they are there. I LOST MY HUSBAND IN THE WAR FRONT AND WHEN HE WAS IN THE ARMY AND WAS FIGHTING , THIS IS EXACTLY HOW I FELT. iT'S NOT EASY BEING A ARMY WIFE. iT REQUIRES LOT OF PATIENCE, CONFIDENCE, AND COURAGE AND EVERY CAN'T POSE THIS ROLE. bUT EVEN I LOST MY HUSBAND I'M PROUD TO BE A ARMY WIFE. Soldiers can’t pretend. They can’t twist the words. They are honest in relationship in everyway. That is what makes them more loveable. Nice post. Are you a soldiers wife? Thank you for your comment and i agree with you. It only a solider's wife/lover knows the real pain in those heart where we as individuals never see or feel. Thank you for your comment and as you say soldiers are also humans and need love as much as we do . Some times soldiers need love more than average as they have seen the worst of life.I agree with you , that once they come home to their families they give their best to the people they love. Thank you so much for your comment and i'm sorry to hear about the loss of your husband. I know it's not easy to loose the man you love , but your husband was a hero who sacrifice his life for his country. As much as your husband we are proud of courages wives like you. Thank you for your lovely comment.I agree that soldiers are honest people but among them you do find soldiers who are not lovable and harsh. Every ones not equal and some have faults.